AppOptics is an extensible custom metrics and analytics platform that ties together your applications, infrastructure, and business metrics for amazing insights. SolarWinds® AppOptics collects and correlates custom metrics from applications, infrastructure, and business performance. With an API-first approach, you can send metrics of any type via language bindings, open source agents, or even curl commands. 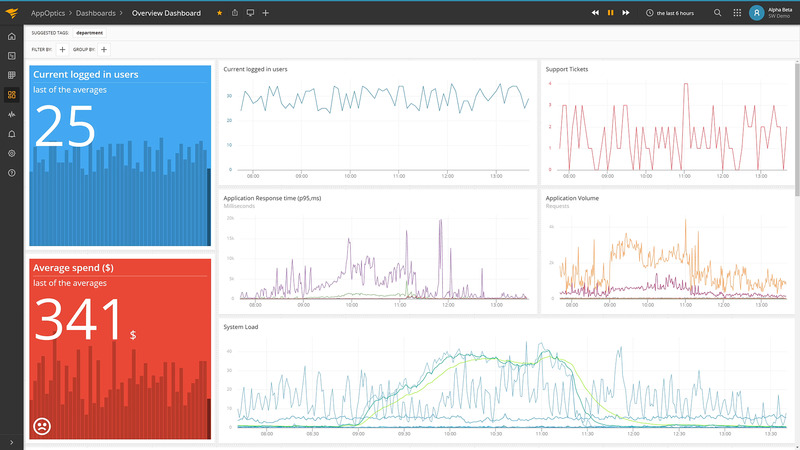 AppOptics helps you aggregate and use custom metrics for faster alerting, visualizing, and troubleshooting. The true value of data is not always apparent on the surface. AppOptics gives you insights into metric sums, differences and ratios. You can collect metrics, such as number of logins or purchases, and correlate them with a business performance metric such as revenue. and track inconsistencies between the same metrics over select periods of time. You can even add multiple tags for easier metrics segmentation and issue troubleshooting. For example, you can quickly analyze your Amazon® Web Services infrastructure and aggregate by region, name, instance type, or any other custom tag. Use SolarWinds AppOptics to get unprecedented insight into your applications, infrastructure, and business performance.